Leap Day of Leap Year. 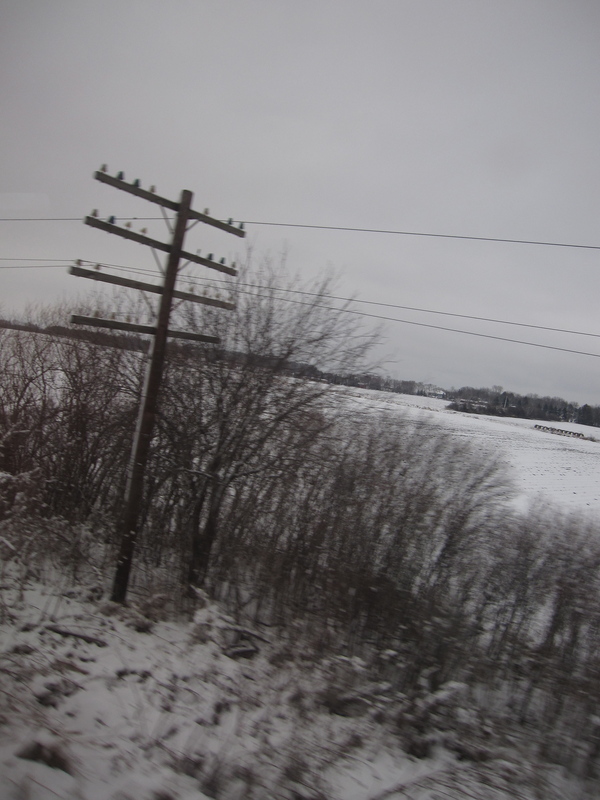 I am on the Hiawatha, headed to Chicago. I am beginning to anticipate an adventure. A conference. Over ten thousand writers coming to shake hands, shake heads, shake whatever needs shaking. I am ready for unexpected undertakings, scenes, ventures. Or, so I think. Mr. Adventure meets me the moment I step out of Union Station. Let’s call him Mr. TallandDark because he is tall and dark. We could call him Mr. Springy too because he walks with a spring in his step. But TallandDark sounds more mysterious. Besides, the wind is brisk, his smile balmy, and I feel so lucky to meet this helpful man. He bows slightly and asks if I need a cab. I am so in the spirit I say yes, yes, I need a cab for the cab will get me to the Palmer House that will get me to the AWP that will get me to dazzling panels and brainy readers and literary rock and roll. Mr. Tall&Dark whisks my luggage from me and I am thinking, wow, talk about curb service. We fairly float to the waiting cab and he lifts the trunk lid, puts my luggage in securely. Then, he turns, his lyrical voice changes. Please, he says, extending his hand. Can you give me some money? I am neither jet-lagged nor sleepy but I cannot comprehend this. I have never paid a cab driver before getting into a cab. His gaze hypnotizes me. He stands firm, though his shoulders have dropped. I pull my wallet out of my purse, magnetized by the moment.Yes, he says, sounding apologetic. I am homeless. I need money to feed my family. I open my wallet and a collision of thoughts bombard me: how does a homeless person drive a cab? I am being scammed. Oh no, he’s going to grab my wallet and run. I am really really dumb. At that point, the cab starts to drive off with my luggage in it! I am stunned. My head jerks between the moving cab and Tall&Dark&YesNowHomeless. Suddenly, Homeless slaps the trunk with gusto and yells, Hey! You! Wait! He rushes to open the car door and I jump in, the bills in my wallet still fan-folded open. I am about to give him perhaps a five, or a ten as my cognitive dissonance joins the cacaphony of the city. Don’t you give him any money, the man behind the wheel says, breaking my trance. This is the first time I realize there was actually a man behind the wheel, for in the brisk wind my eyes are watering, the cab windows slightly tinted, and my neurons overloaded. I stare at the cab driver through the cage that separates us. They do this all the time, he says, irritated. Usually, the cops are here and they get them. I tuck my bills back in my wallet and turn to Tall&Dark&Homeless. I hand him a dollar, my heart snapped out of one world, my head whacked into another. He smiles, but it is a close-lipped smile: a practiced snickering, sniggering sneer. The cab accelerates. I look back and watch him join two other guys standing next to a yellow ribbon cautioning, Do Not Cross This Line. The three of them back-slap one another like seasoned street performers. I grin. I got to see their show for a measly buck.